Can a few thousand well-intentioned engineers and scientists help 25,000 hearty, well-intentioned South Africans put the world back together after a comet wipes out most of the planet? You bet! Instead of following the apocalyptic post-disaster scenarios of On the Beach or the Mad Max films, this fiction debut from technological apologist and scientific optimist Florman (The Introspective Engineer, 1996, etc.) more closely resembles B.F. Skinner's Walden Two. Before he can offer his cheerful take on humanity's ability to solve problems, however, Florman must wipe the slate clean by having technology seem to fail: in the year 2009, a missile fired from Earth with the intention of deflecting a comet goes awry, exploding its warhead in such a way that on Christmas Day the comet slams into the Pacific Ocean, off the coast of northern California. The fiery shockwave, massive tidal waves, and freezing rain are both horrifying and intriguing to an international convention of engineers aboard a cruise ship off the southeastern coast of South Africa, the one part of the globe where the comet's effects are minimal. When the ship hits something and starts to sink, said engineers calmly decamp to the mineral-rich tropical province of Kwa Zulu Natal, where some 25,000 others have also escaped extinction. 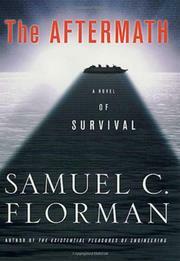 Narrated in part by technological historian Wilson Hardy Jr., the story moves forward as a series of dialogue-heavy lectures in which Hardy and other characters pile on the fun facts about science, technology, and those plucky South Africans (Muslims and Hindus, as well as Boers and Brits), while the ship's high-tech brains form committees with the mid- to low-tech survivors to rebuild, restore, and make babies. A passing challenge from a marauding pirate queen is almost effortlessly rebuffed, and despite a lack of most 21st-century luxuries, life goes on. Contrived and dry, but resoundingly upbeat.